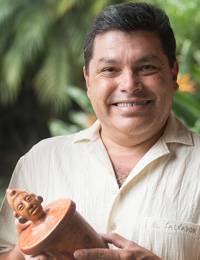 The unique art of the Maya people finds its way to this hand-crafted vase from Oscar Rodolfo Mendoza. 'We preserve the ceramic techniques they developed thousands of years ago,' says Mendoza of this piece. Color for the background is obtained from achiote seeds, and the image details are done with acrylics.